I finally parked myself in front of the computer without going in the internet. It turns out that you can get a lot done when you stay off the internet. I did my EQ3 lesson where I learned a few more things that I didn't know before. Imagine that! 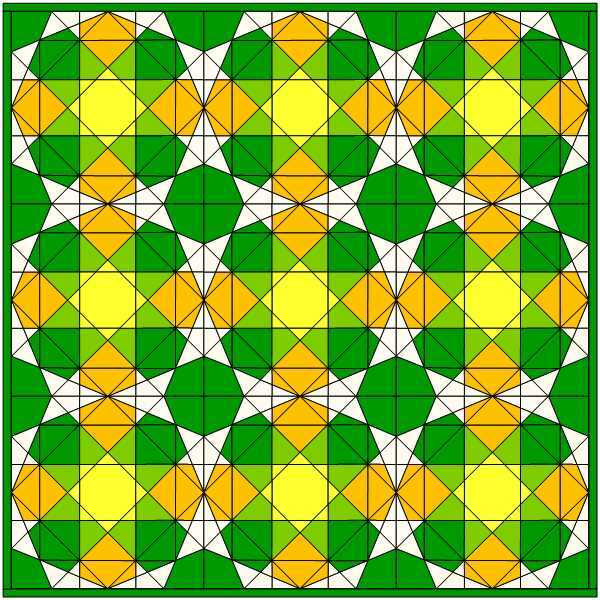 Lesson 3 is about creating blocks using guidelines and drafting from the center. I did not know that I could draw my own guidelines! 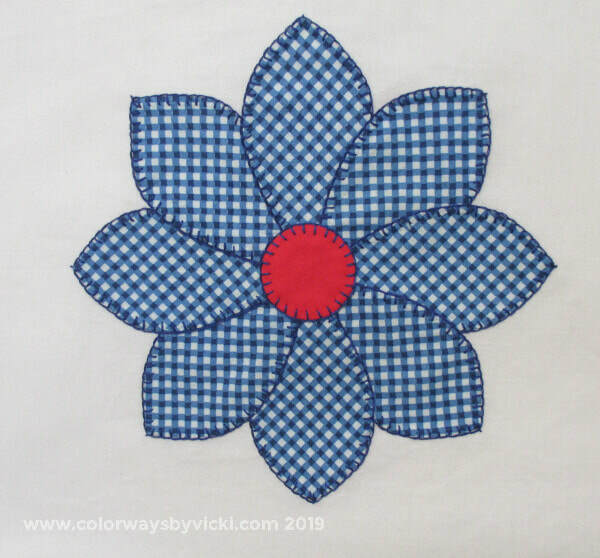 Then we created this applique block. 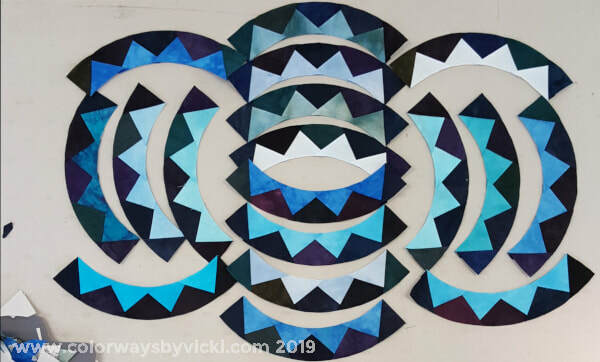 I've never done applique blocks before and certainly never used wreath maker. It's exceptionally cool! This is the quilt put together as piecing and applique. I don't particularly like the quilt but that wasn't the purpose. 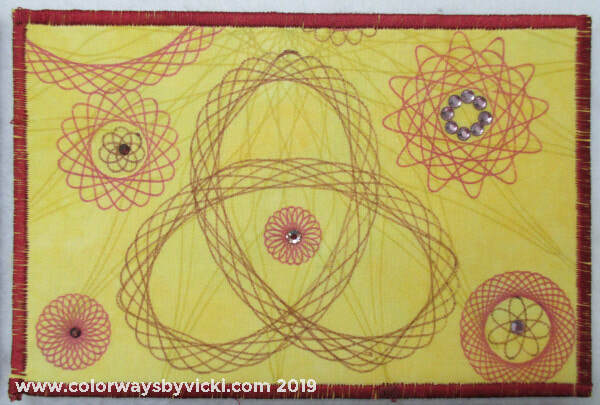 The final part of the lesson was how to turn the applique block into quilting lines. That was new to me also. After I finished this I got to thinking about a book my friend loaned me and whether I could draft some of the designs in EQ. Instagram is all atwitter over this book. People are making carved stamps from it. 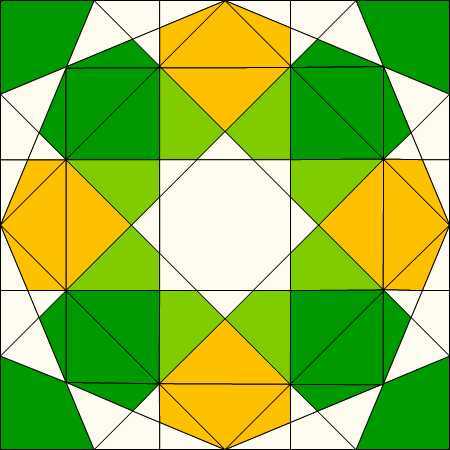 I thought to try to design pieced blocks from it. Now I know that this has probably been done and all of the blocks are probably already in the EQ library. That's not the point. The point is the exercise and it was a darned good exercise. I did the first two patterns in the book. The third pattern is based on a hexagon so I'll have to wait a couple of chapters to learn how to do that. 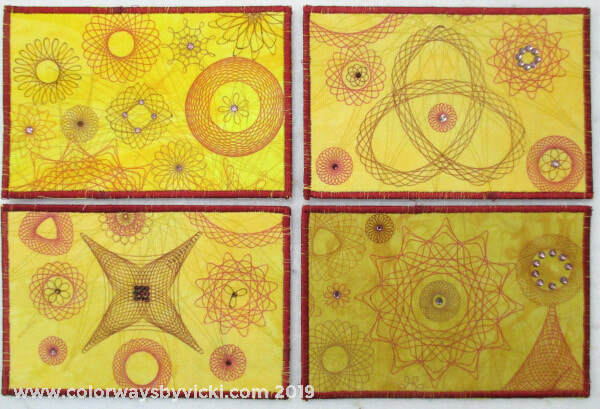 ​Here are the first two patterns in the book. I don't know if I'll be able to design all of them but I'll give it a try. I couldn't have done it without learning about guidelines in this lesson so that's good. 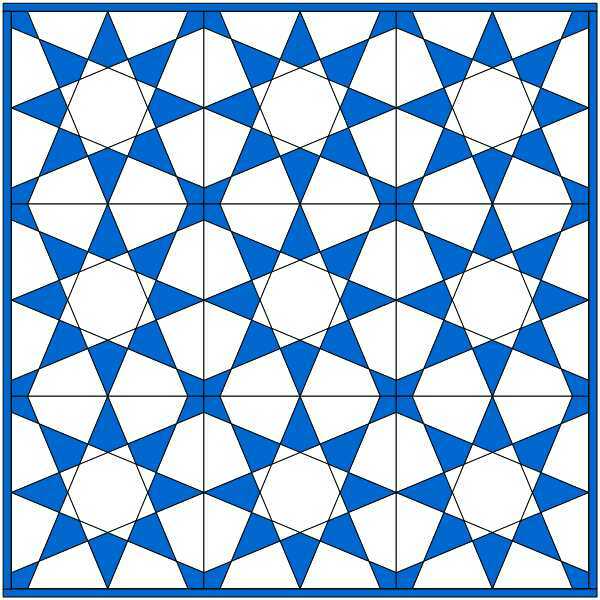 After I got the quilt "designed" I decided to analyze the block and see what I could do with the lines to make it piece-able. I basically set it up as a 9-patch. 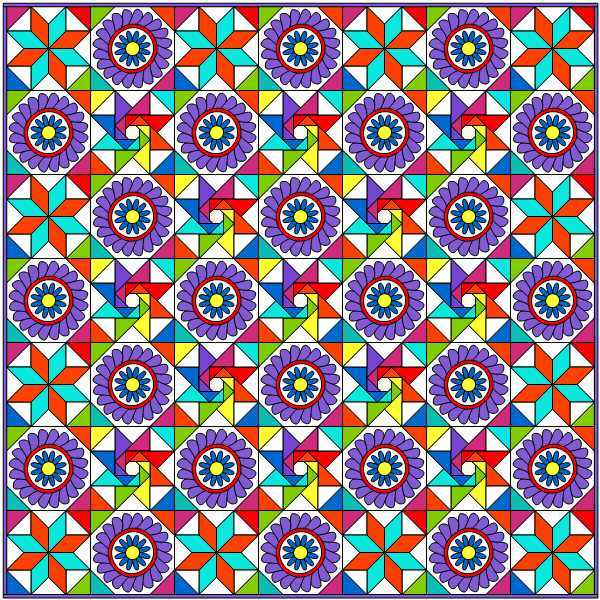 This one actually isn't a bad looking quilt. School was dismissed and I headed out to meet my friend at a local bar for recess. 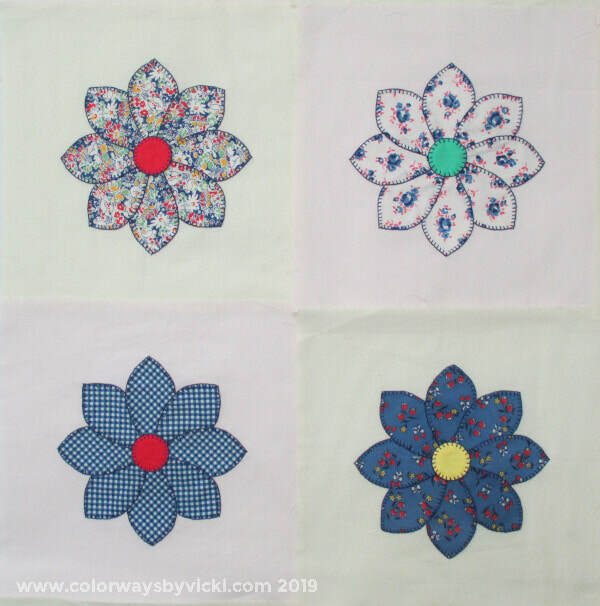 I finished up another set of 4 of these flower blocks. I might be watching too much TV but at least I get a little something done. Because I bought these blocks from the Virginia Quilt Museum I refer to the person who made these as "Virginia". I love studying every block to see how Virginia cut them out. Just look at the tips of each petal in this flower and you can see that the gingham check is centered perfectly on each petal. Virginia and I could have been related! 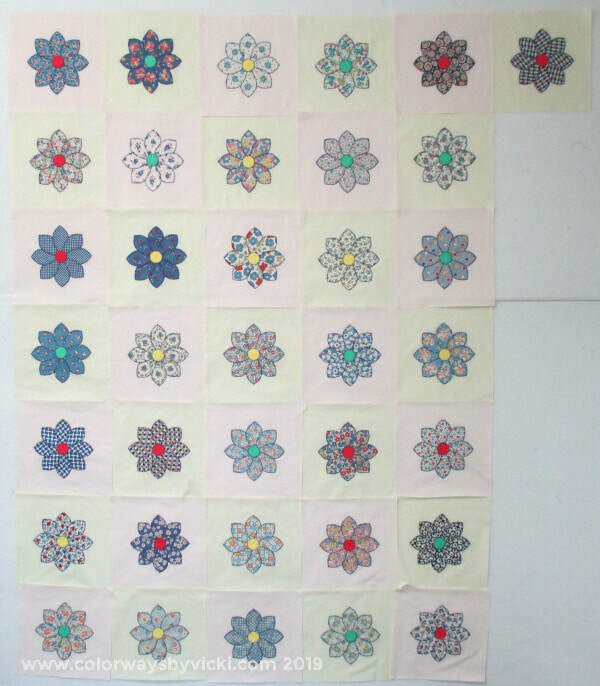 Here are the 36 completed blocks. I have 18 more to do. 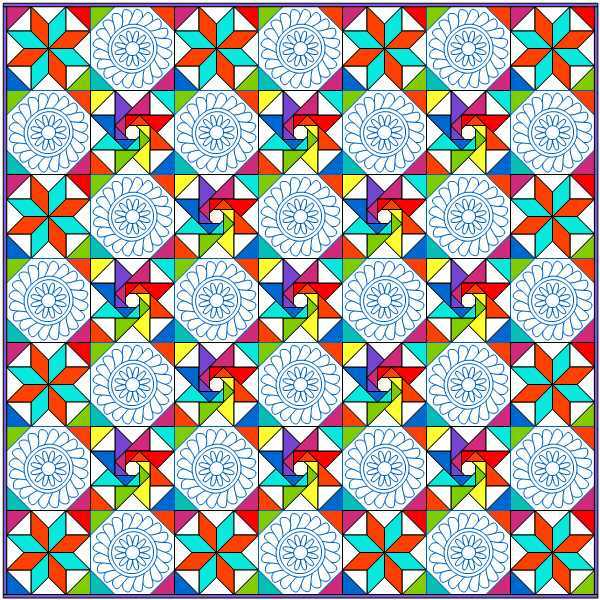 The current plan is plain half blocks for the border so the finished size will be about 70 x 90. Unless I decide to do something on borders and let's hope that I don't do that. I got the fish fused and I'm mostly thrilled with the results. These are my 2 favorites. These are all acceptable too. Yes, they are lumpy but the grouting process mostly smooths out the edges. These are the only two that I'm declaring as outright rejects. For me, that's a really good success ratio! I have a stack of reject fish from previous firings. I'll break these up and use them in a scrap project so they will not go to waste. 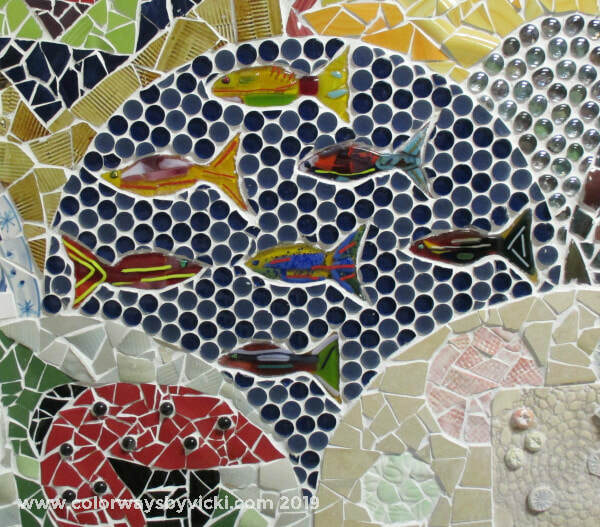 The pale one is a reject because the fish will not stand out well against white grout. The dark one doesn't have enough interest although it could work in a pinch. 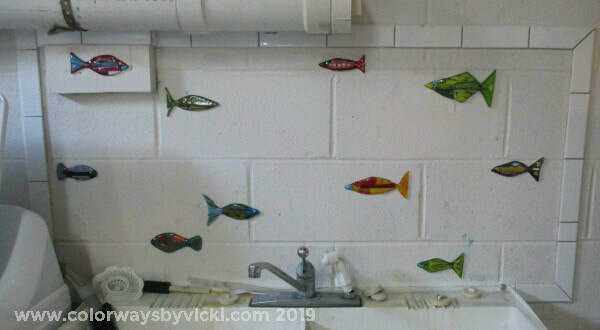 Here are all of the fish stuck to the wall. I "baste" them up with tape until the mastic firms up. 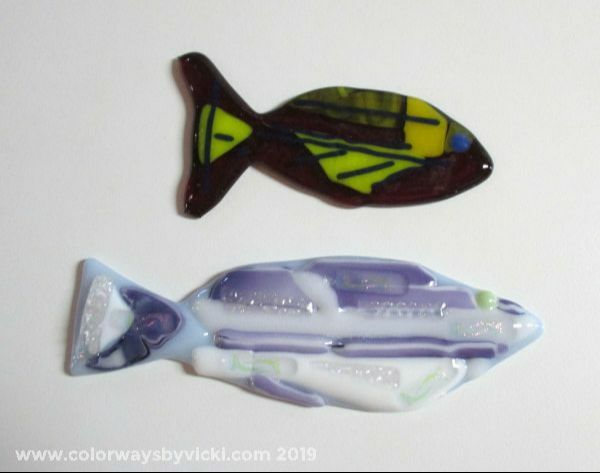 If you look on the right and left edges you can see how I used a few of the reject fish. 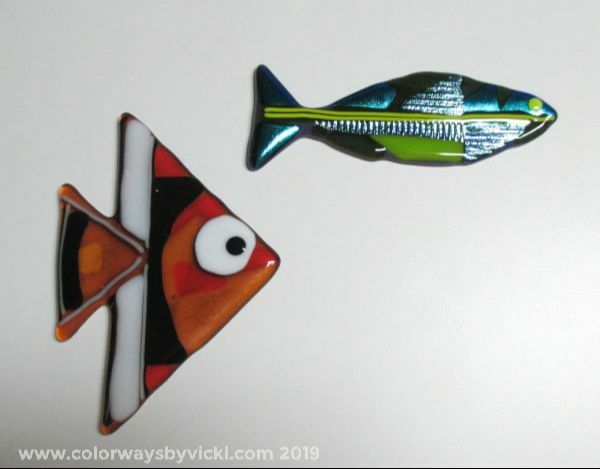 Sometimes the body is OK so I can cut off the tail and have the fish swim in from the edge. In once case only the tail was salvageable and it's a really fine tail. I added some of the background just to see how it's going to look. 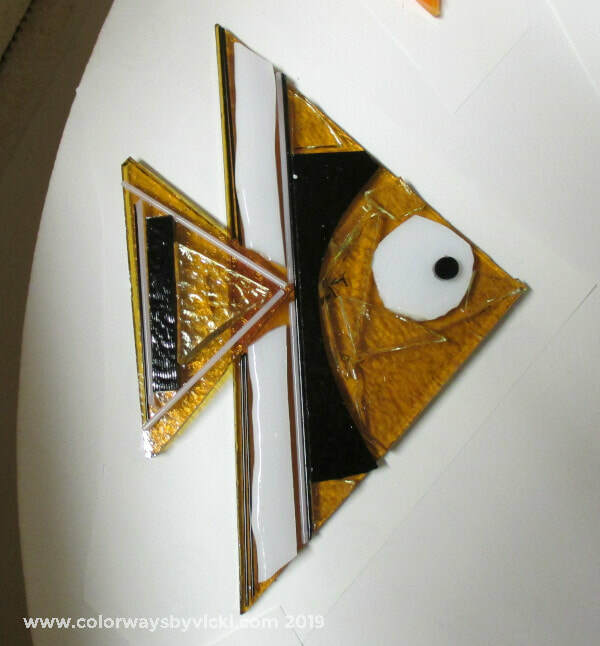 I did straighten out that one partial tile near the fish nose. It was bugging me in the photo. You aren't really supposed to cut glass tile but this isn't in a shower so it will be OK. I'll have to wait for the fish to set up before I do any more. 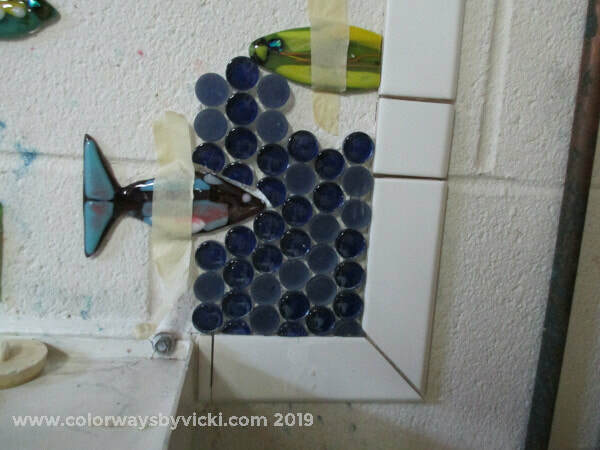 The blue glass tiles are from my friend's bathroom remodel. I love free materials! 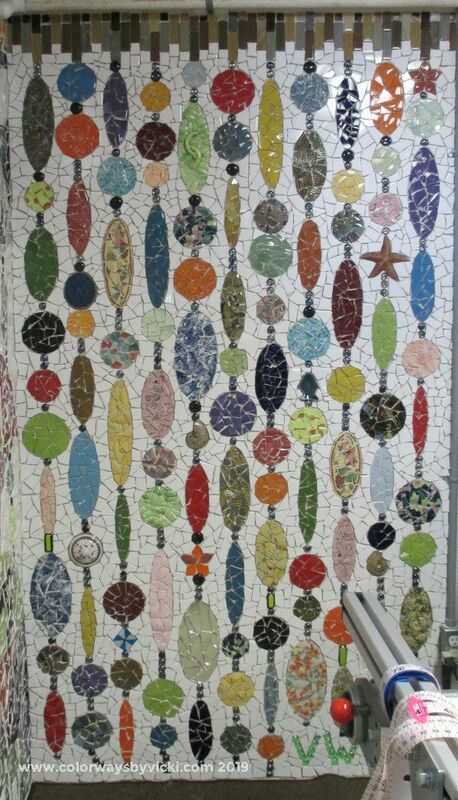 My goal is to have this done by the end of April so that I can grout both areas in May. In Virginia Spring is here in a big way. The Dogwood by my sewing room window is blooming and my red car is currently lime green with pollen. But inside I'm celebrating with a pretty Spring blue-purple fabric. 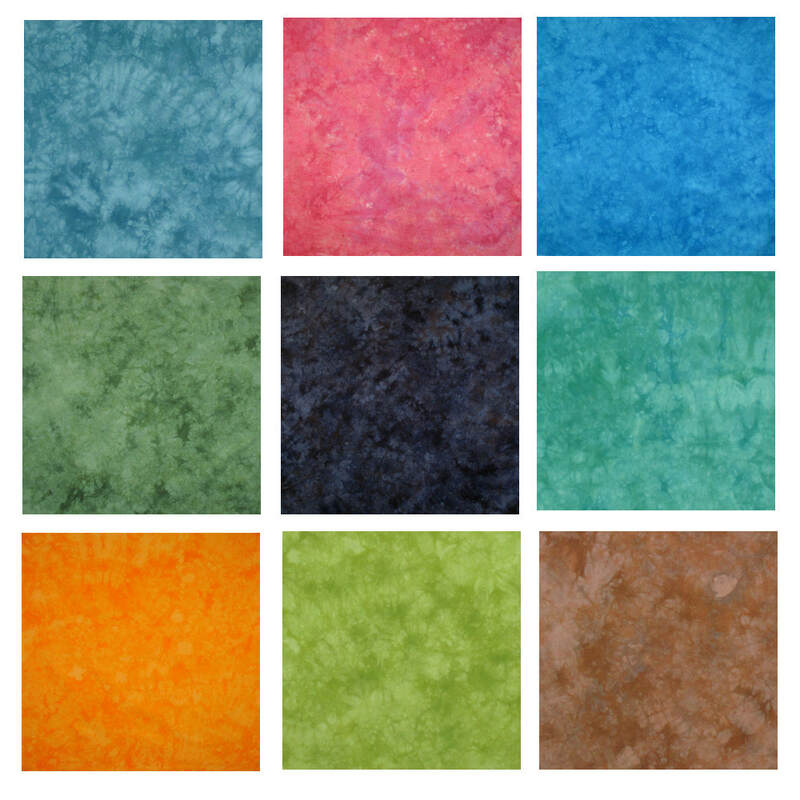 Larkspur Shades Pack is the fabric of the week and is 20% off through Sunday. If you need a little Sky to go with your Spring landscape you can't go wrong with Blue Sky, Monterey Bay or Sea and Sky. Monterey Bay and Sea and Sky are back in stock this week. Blue Sky is a bright summer sky blue, Sea and Sky is for a cloudy day and Monterey Bay might be dusk at the beach. Last week while dyeing I made a huge math error that left me with a big container of black dye. 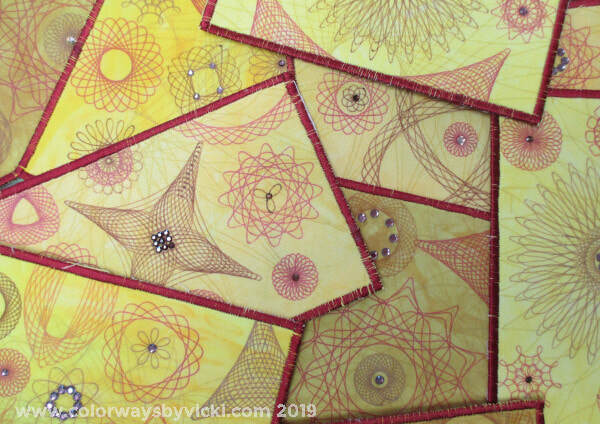 It was a perfect prompt to try a monochromatic spiral quilt back. It turned out great! I shared the photo ion Instagram and someone asked to purchase it within an hour. So I'm offering this as a custom dyed item. 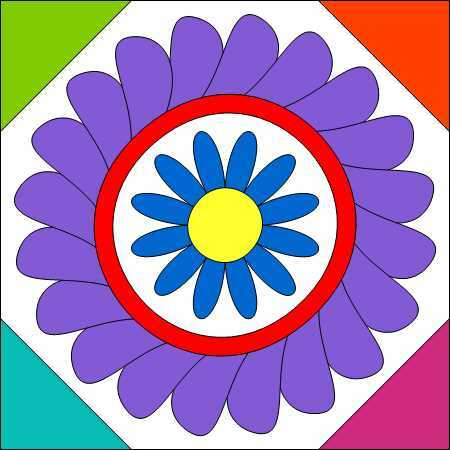 I can do the monochromatic spiral in any color you want. The quilt back is at least 108" square and is $78. Contact me if you need your own custom spiral. This week's featured project is Atomic Atoll by Louise Hall. 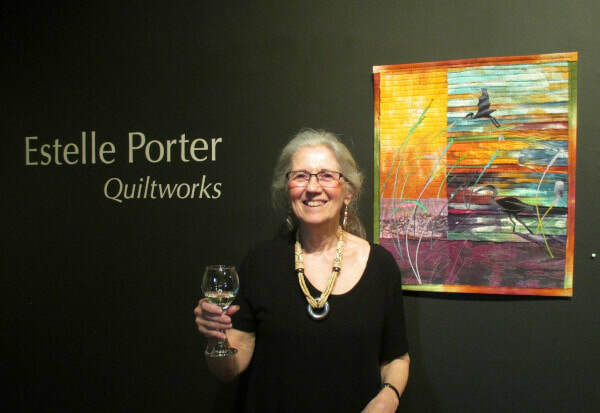 She sent along a great description of the quilt so I'll let her tell the story. 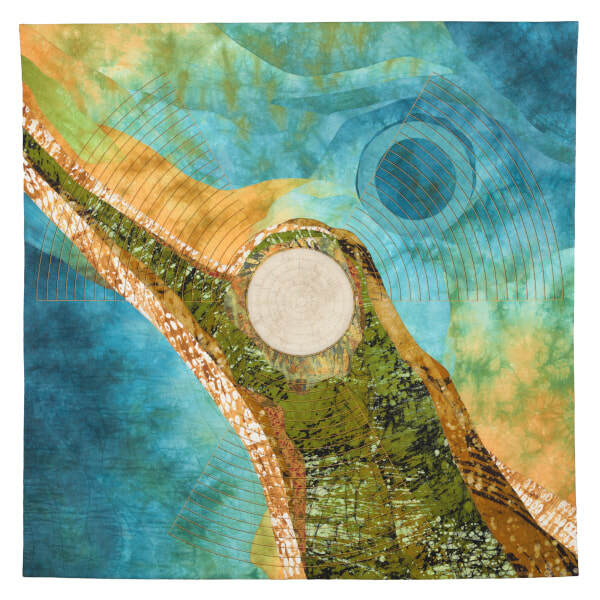 “Atomic Atoll” was created for the SAQA Regional Shifting Tides: Convergence in Cloth juried exhibition. 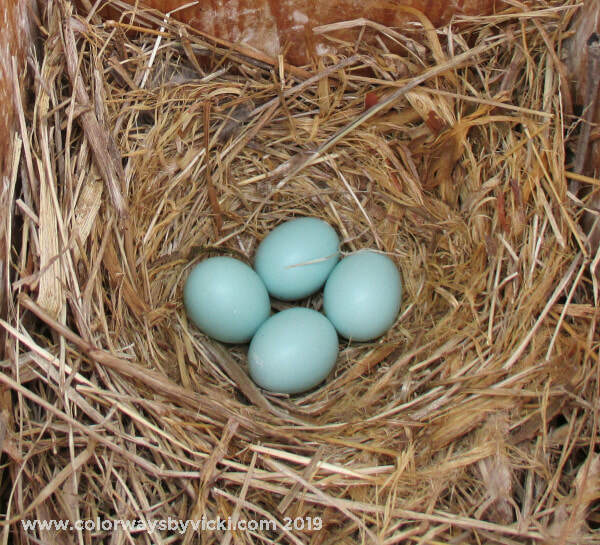 Juror: Ann Johnston. The exhibition will tour the west coast from 2019 - 2021. The dome, or The Tomb as the locals call it, is located on Runit Island which is part of the Enewetak Atoll in the Pacific Ocean. The US conducted 43 nuclear tests there from 1946-1958. In the late 70's, US servicemen buried the nuclear waste under an 18" think concrete dome. It was supposed to be a temporary fix, but a permanent decontamination plan never came to fruition. The contents of the dome, as well the surrounding sediments, are dangerously radioactive. Fabrics chosen are my attempt to reflect the tortured nature of the atoll. The dome is mirrored by its twin underwater bomb crater. The stitched overlaid radiation symbol was deliberately created in an understated way to symbolize the unseen danger that will eventually spread contamination to a far wider area. Louise used Barrier Island, Sugar Maple and Red Sunset Gradients. You can see more of Louise's work on her website. For sharing, Louise received a 20% coupon for the shop that's good for 3 months! 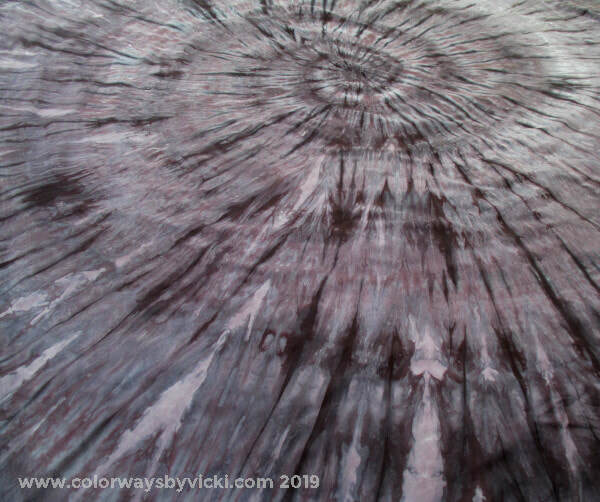 If you have made anything with my hand dyed fabric I hope you will consider sharing it in the Customer Gallery. The only rule is that projects have to be complete. 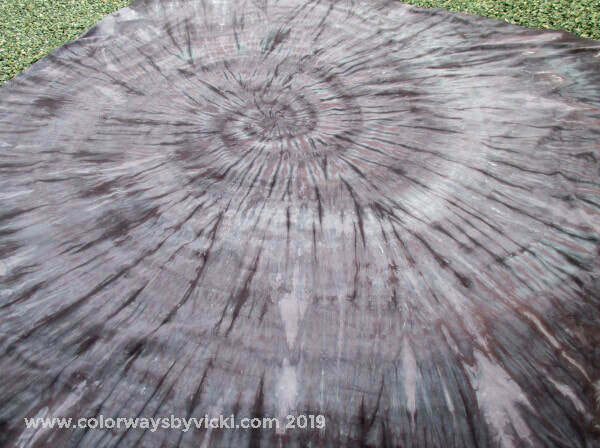 It doesn't have to be made totally from hand dyed fabric, just include a recognizable amount. I showed you my fish bases the other day. Slowly I am working on building my fish. I can only do this for about an hour at a time because the fumes from the glue (just plain Elmers gel) starts to bother me. So I can get about 3 done in a session. They are all built from scrap bits with some frit and stringers. As they melt in the kiln the surface will smooth out. 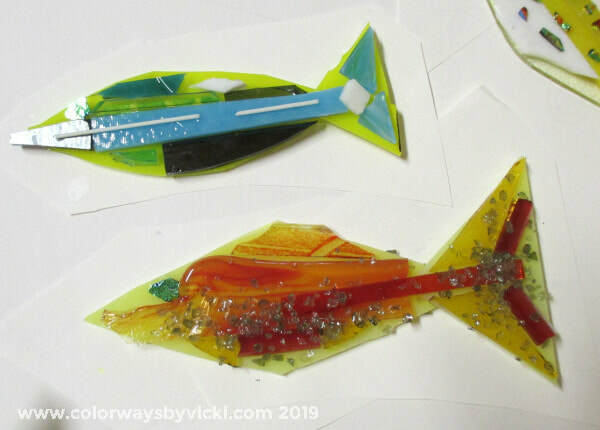 The colors are all based on whatever glass bits that I have and some of these are striker glass so I'm bound to get some big surprises in the end. Some will turn out great and some will be rejects sent back to the scrap pile but I'm really hopeful for this one. I don't need this many but I'm going to make enough to fill the kiln and hope for the best! There's so much glue in here that I'll have to vent the kiln and the basement really well. 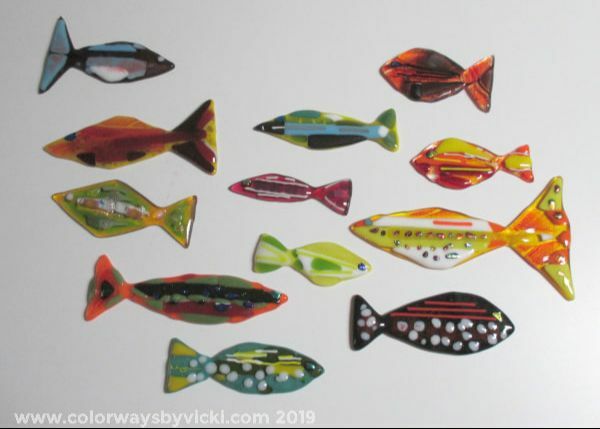 Hopefully I can get these fired this weekend and have some cute fishes to show you next week. This weekend is sewing days with Country School and I'll get to go both days this time. 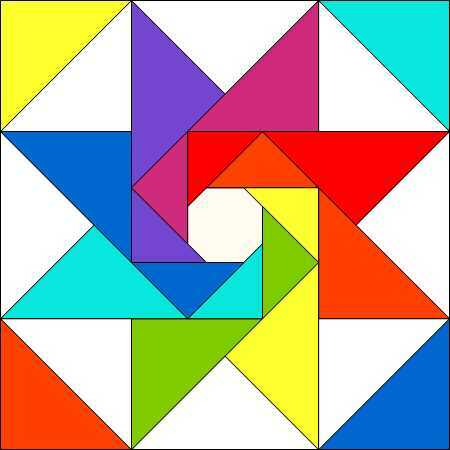 I'm looking forward to working on the 4th of July quilt again. Blue Ridge Gradient - 20% off! 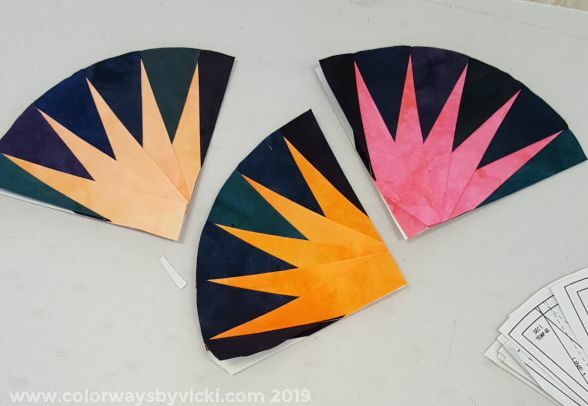 This gradient was inspired by the sunset over the Blue Ridge Mountains near our home. It's the fabric of the week this week and is on sale 20% off through Sunday! 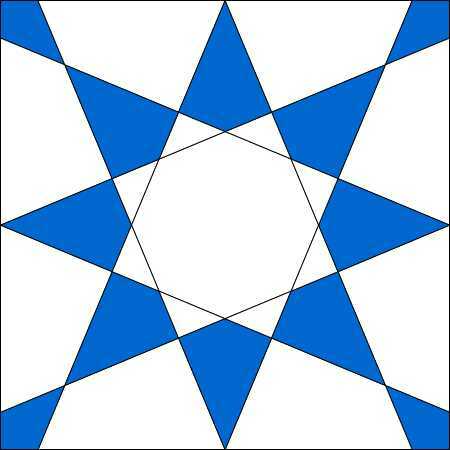 Stars are one yard cuts and are great when you need just one color. These are the fabrics that I have fun with mixing unique dye colors. I've added 10 new ones and you can see them all here. In two sessions since Thursday I was able to get the wall finished. I really am getting too old to sit cross-legged on a concrete floor for hours at a time. But it's done! 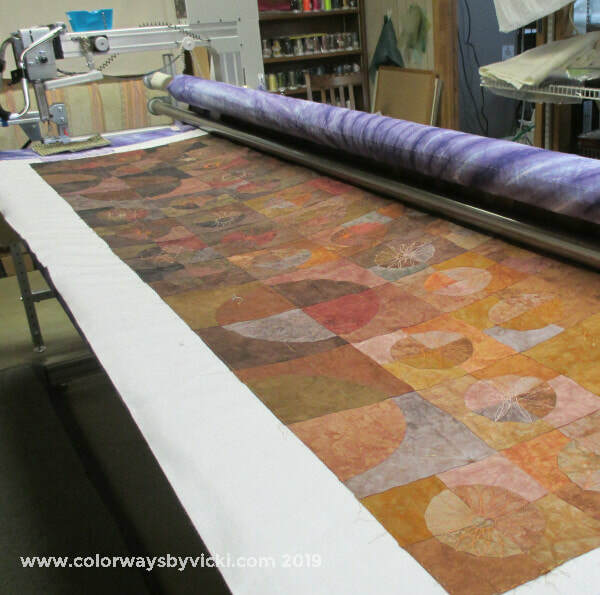 ​Of course, it's not DONE done, but the messy stuff is done and I was able to clean up around the longarm. I could put this back on the frame now that all the pottery bits are off the floor. Before I grout the wall I'm going to get the backsplash finished so I can grout both in a weekend. It's going to look like this. Both the wall and the backsplash are sponsored by my best friend's house remodel! The background tile from both came from her bathroom remodel project. 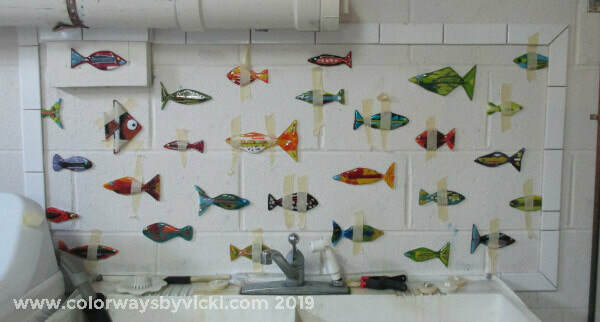 I need to make more fish first and that meant most of Sunday spent clearing off the glass workbench. I haven't done any glass for about a year. 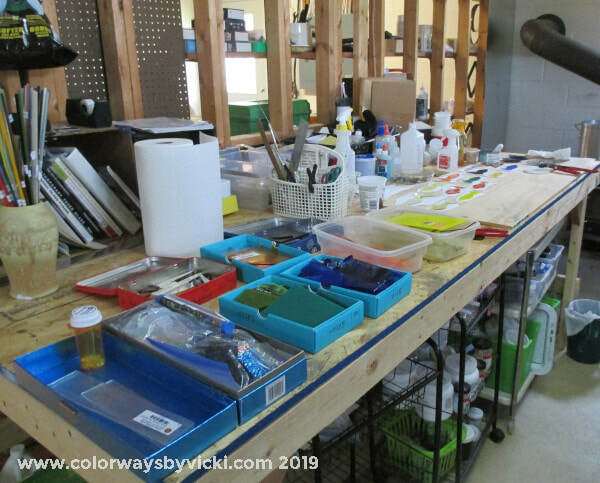 I hurt my shoulder in May and then got caught up in dyeing 100 yards of fabric every week. The glass bench turned into a dumping ground covered in 17 layers of dust. Yes, this is cleaned up. 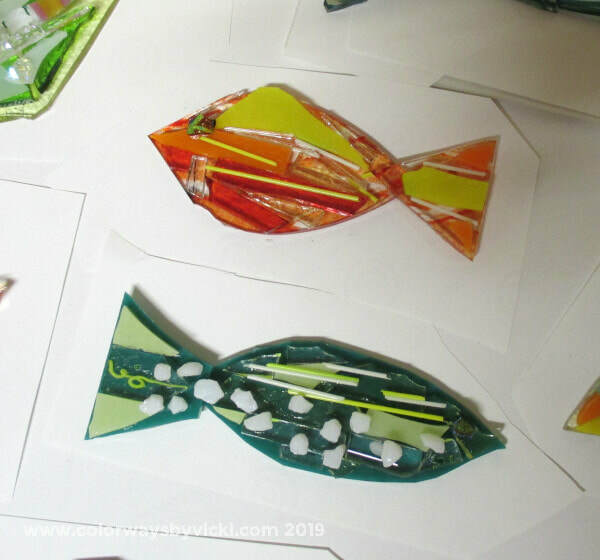 The boxes of scrap glass are my materials for making new fish. 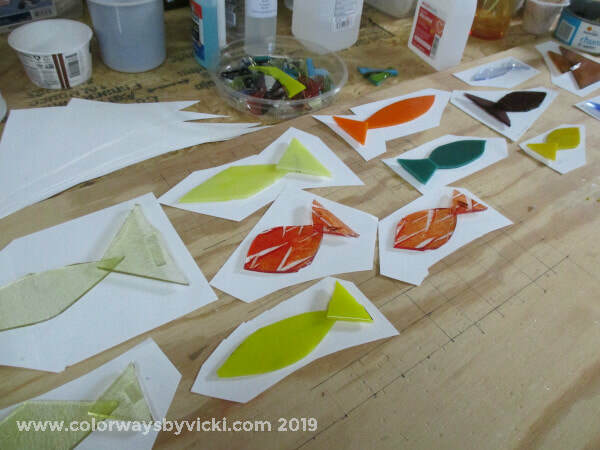 Last night I got a bunch of fish bases cut out and glued together. They are ready for decorating now. 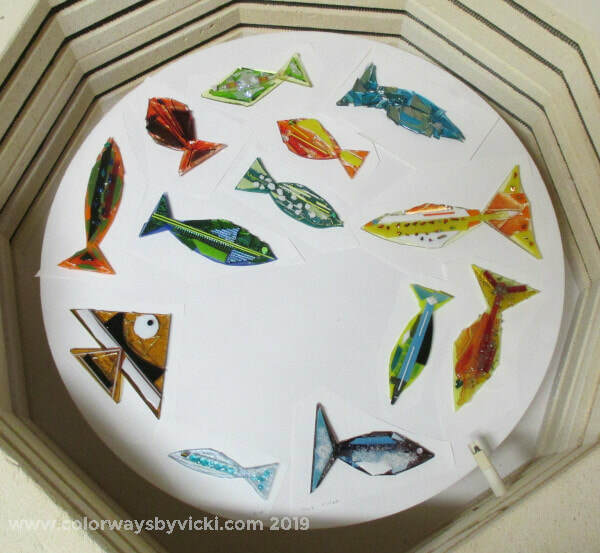 Hopefully I'll get these in the kiln later this week.